I’m a lucky guy. It’s my “job” to travel the country and spread the word about FMCA with my wife, Sondra. I love meeting FMCA members and swapping our campfire stories. I recently spoke with Corey and Tonya Secrest, F461379, and I am really impressed by their story. Corey and Tonya are full-time RVers. After years in their respective careers and a sticks-and-bricks home, they decided to hit the road. In just six weeks, they sold their house and donated most of their possessions. Tonya gave notice at her job of 13.5 years, and they set out in their Hawkins Motor Coach. (more on that later). How did this happen? How can they do this? I had so many questions for this young couple. I am still in awe of their sense of adventure. Folks, this is what RVing is all about – getting out there and hitting the road! Here’s how it happened… Corey and Tonya love the outdoors. They’re experienced campers and enjoy hiking, as well as off-roading in their Jeep. Before full-timing, they were avid boaters. They spent many weekends at the lake on their boat. They wondered whether they could take the sense of adventure present in their “weekend life” and make it part of their daily life. Plus, they wondered whether being mobile might make their business, which Corey worked at full-time, more efficient. Inspiration was close. Tonya’s parents, Wendy and Kenton Zitterich, F429494, are FMCA members. 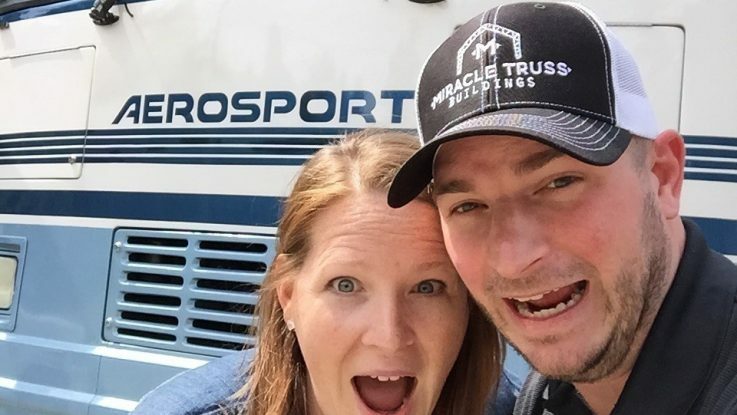 Five years ago, they sold their home to become full-time RVers. Seeing Tonya’s parents transition to life on the road so seamlessly inspired Corey and Tonya to take the leap themselves. As I mentioned before, the couple wondered whether going on the road would make the company more efficient. Corey and Tonya own Miracle Truss Buildings, C13215. The company specializes in DIY-kits for RV storage buildings and casitas, as well as any other type of structure (hangars, homes, barns, or commercial properties). They realized working from the road would help connect them to customers. Tonya, a formal dental assistant, began working for Miracle Truss Buildings alongside Corey. “I gave my office of 13.5 years a one-month notice, and six weeks after putting my notice in, we were on the road. Whoa… Just thinking about it still makes my head spin,” Tonya said. Tonya admits that it was an adjustment taking on a new career, but it was worth it to be able to travel as they wish. As full-timers with a business, they travel the country to building sites and connect with their customers in real-time. Currently, they are in Oregon and Washington for projects. While they meet customers, attend trade shows, and photograph building projects, they have a dedicated team that handles the day-to-day operations. This couple is unusual in another way, too. Or, I should say, their motorhome is unusual. After looking at new motorhomes to purchase, they decided it came down to quality. Both strongly felt that the construction of their RV was of utmost importance. They purchased a 34-foot 1996 Hawkins Motor Coach Aerosport Special Edition. Their motor coach is 1 of 10 ever produced! HMCs were luxury coaches produced from 1984 to 1996. They are pretty rare, and I had never heard of them myself until I spoke with the Secrests. On October 16, 2017, Corey and Tonya celebrated what they call their “nomadiversary.” This marks one year on the road, living as full-time RVers. In just one year, they logged 8,440 miles on their motorhome; visited 37 campsites, 12 national parks and monuments, and 12 states; and hiked hundreds of miles. I’m in awe of their adventure and wish them nothing but the best. 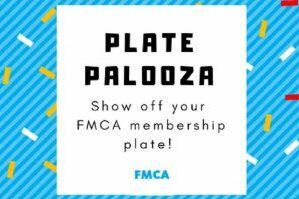 I’m honored that they are part of FMCA, and I’m glad FMCA can make their lifestyle a little easier. After all, that is what FMCA is all about – we’re here to support RVers and take care of the details (insurance, roadside assistance, mobile internet, etc.) so they can have more FUN. Having fun is what it’s all about. Here’s to many more “nomadiversaries” for Corey and Tonya! P.S. You can check out their adventures at www.facebook.com/gothatroad or www.instagram.com/gothatroad. Or read more of their story here. Very nice story about the lifestyle. Thanks Jon for finding these folks and sharing their story. Enjoyed the article. Thanks, Steve. I am amazed as I travel the number of members (and non members) that are working on the road while they enjoy the beauty of the country. I have also met families that are on the road home schooling, working, playing, and studying……amazing. Hope you had a great summer working…and playing! !